Data storage business Buffalo has upgraded its TeraStation 5000 family of NAS devices to include new 6 and 8-bay iSCSI versions. The new TeraStation 5600 and 5800 are Buffalo's first combined offering of NAS and iSCSI, and are designed specifically for small businesses who need large storage capacities with fast iSCSI data transfer rates. 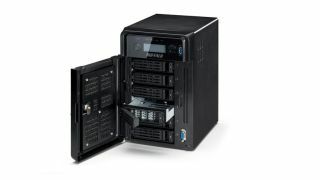 The new Atom D2700 dual-core processor powered devices feature an additional 2 and 4 bays on top of the standard 4-bay TeraStation, giving storage capacities of 6-24Tb on the 6-bay 5600 devices and 8-32Tb for the 8-bay 5800 devices and both systems have the ability to connect to both iSCSI and Ethernet networks simultaneously. The TeraStation 5000 range also includes a host of business support services including Buffalo Surveillance Server, which enables video recording from up to ten IP cameras to be streamed directly to the TeraStation device, and ten licenses of NovaBACKUP Business Essentials.